WASHINGTON â March 7, 2014 â The U.S. Navy's X-47B Unmanned Combat Air System (UCAS), built by Northrop Grumman Corporation (NYSE:NOC), has won a Laureate Award for "extraordinary achievements" in Aeronautics and Propulsion. Aviation Week , the industry's largest information and services provider, bestowed the award during a March 6 event held at the National Building Museum in Washington, D.C. The annual Laureate Awards recognize individuals and teams that have, through their extraordinary accomplishments, inspired others to strive for significant, broad-reaching progress in aviation and aerospace. In 2013, the X-47B UCAS program made history by being the first tailless, unmanned aircraft to land on and take off from an aircraft carrier. Footage of these historic events is available on YouTube . The Navy-Northrop Grumman team has been repeatedly recognized for its technology developments in the field of unmanned carrier aviation. To date, the X-47B has completed eight catapult launches off a carrier, 30 touch-and-goes, and seven arrested landings. Later this year, the X-47B will return to sea for more testing aboard an aircraft carrier. 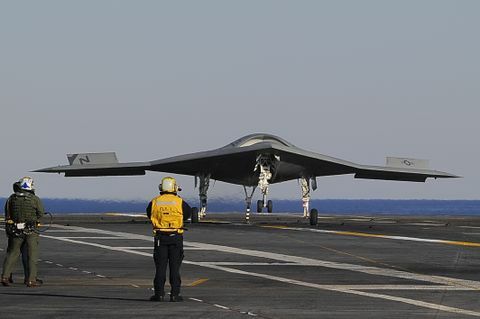 The tests will help the Navy further develop a concept of operations for unmanned carrier aviation, with a specific focus on how the X-47B operates with manned aircraft.